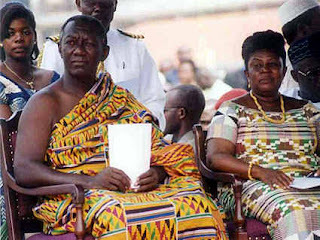 President John Agyekum Kufuor and his wife, Theresa, on Sunday joined hundreds of worshippers at the Christ the King Catholic Parish to give thanks to God for his escape in last Wednesday's car crash at an intersection on the Airport-37 Road.He came out unscratched, when a Benz Elegance saloon car, driving at top speed rammed into the vehicle carrying him on a normal drive from his house to work at the Castle, Osu. The bizarre accident sent shock waves across the country and to show how grateful the nation was to God for the life of the President, the congregation sang praises and said special prayers for his continued protection at the thanksgiving mass. The Reverend Monsignor Seth Osei-Agyemang led the mass and in his homily, counseled the faithful to remain unwavering in times of difficulty and challenges.He said in the life of man there were bound to be disasters and trying moments and that when they happened "we should remain firm in our faith and trust of the Lord. ""When our world come crushing down, we must save ourselves by hanging on to God", he said, citing the troubles and suffering that the biblical Job went through and the confidence he showed in the Lord.